"What you think of Jesus Christ will thoroughly color how you think about everything else," writes John MacArthur. These days, Jesus is often portrayed as a pacifist, a philanthropist, or a docile teacher. He strikes a plastic-and sometimes pathetic-pose in the minds of many. Some prefer the meek and mild Jesus who heals the sick, calms fears, and speaks of peace and goodwill. These things do represent a portion of the Messiah. But tragically, too many have never been exposed to the rest of him. They have never seen a full 360-degree view of the Savior. Until now. 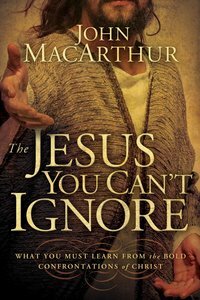 Like an investigative journalist on a mission, best-selling author and teacher John MacArthur walks through the gospel records and shows you a remarkable and compelling picture of the Jesus you can't ignore. About "The Jesus You Can't Ignore"